I admit it. I don’t do change well. This is something God and I are working on, and He has given me many beautiful opportunities to trust that change, though it may involve letting go, is not in and of itself a bad thing. We had our first frost this week. Sunday morning, I peeked outside to see if anything in our garden had survived. My heart sank a little when I saw the leaves of our summer basil blackened and once robust squash leaves looking like limp dishrags on sticks. How I loved our summer garden! And now, it is gone. 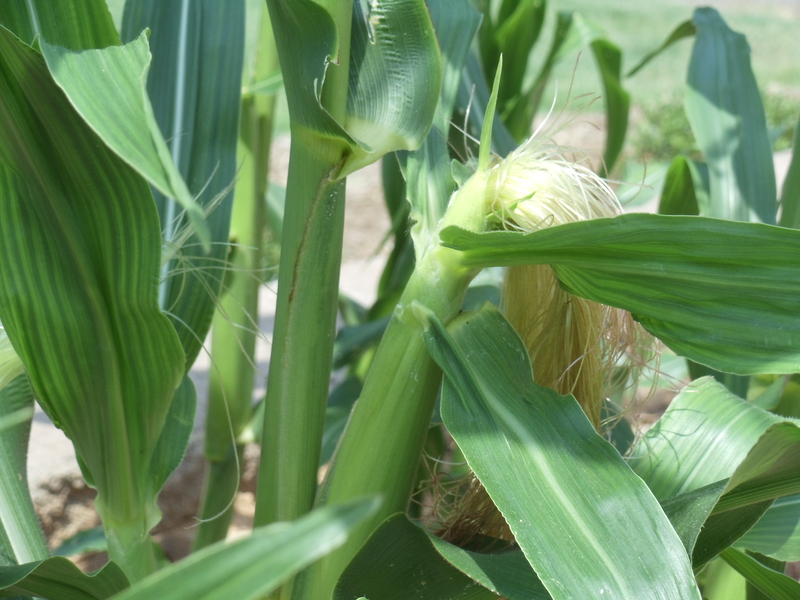 But the first frost of the season also means harvest. That same day, I plunged my gloved hands into the soft earth and pulled out the sweet potatoes that will soon be on our Thanksgiving table. It was a delightful, subterranean treasure hunt. This is only one example of the changes I have seen this fall. Though the letting go always makes me wistful, I am trying harder to look ahead – to smile for what was, instead of crying that it is no longer. There was a time in my life when change, especially the endings of things, would have sent me into all-out panic mode. Not anymore. I have learned to trust the hand that turns the seasons. I have lived long enough to see that things have a way of working out. I have grown in faith enough to know that there is treasure under the surface of whatever change I may be facing. I feel that I should pause here to offer a caveat. I don’t mean to suggest that grieving is wrong. Quite the contrary. Grieving is normal, healthy and biblical. I am referring here to day-to-day, season-to-season, year-to-year changes which may cause discomfort, but do not devastate. In either case, a little faith goes a long way to soften the blow. …and leave the reasons to Him who is for you. Finally! 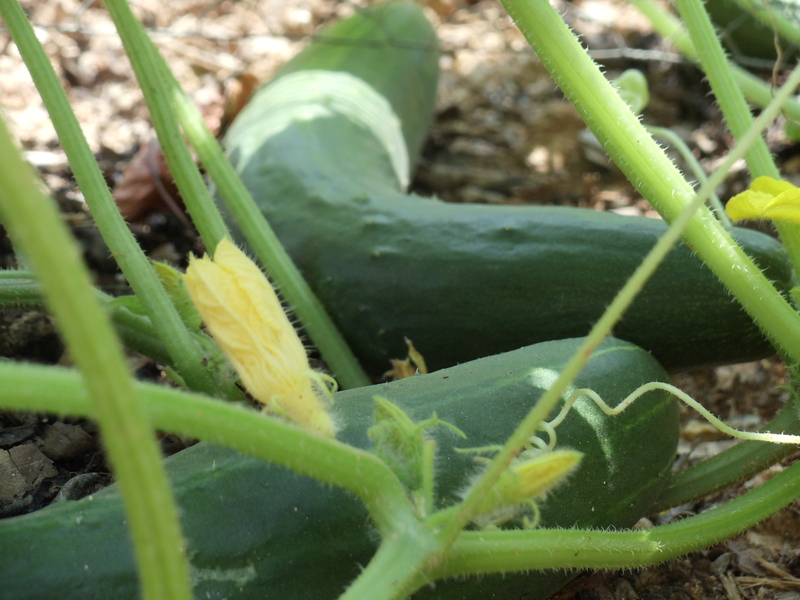 The garden has started to produce! Every morning is a bit like Christmas. I run out to the garden to see what gifts are there. I peek under leaves. I sidle up to stalks. And look! Look at this cute baby cantaloupe! I can almost smell the zucchini bread! Oh, that nasty pride monster tries to convince me that I can take credit for all these wonders, but I don’t listen. Nope. Can’t do it. 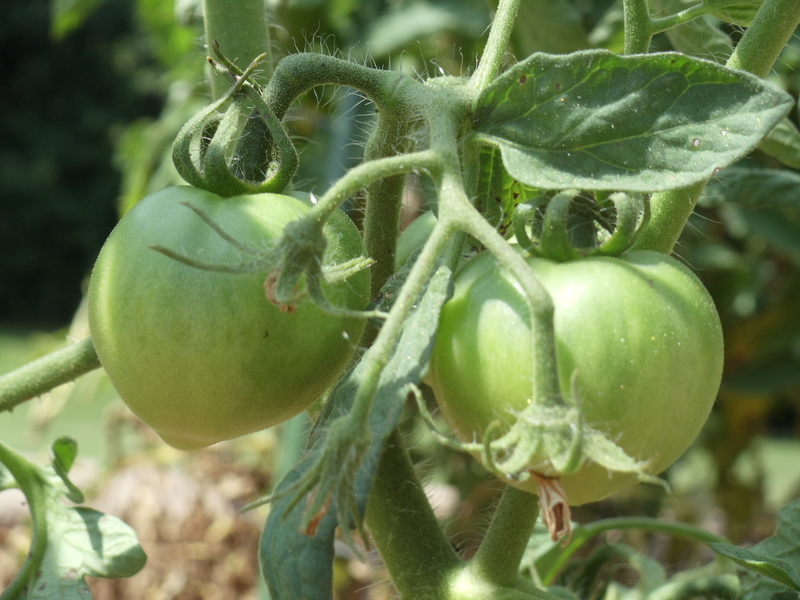 Sure, I’ve planted, watered and weeded, but seriously… did I have one thing to do with the gorgeous color of that eggplant? 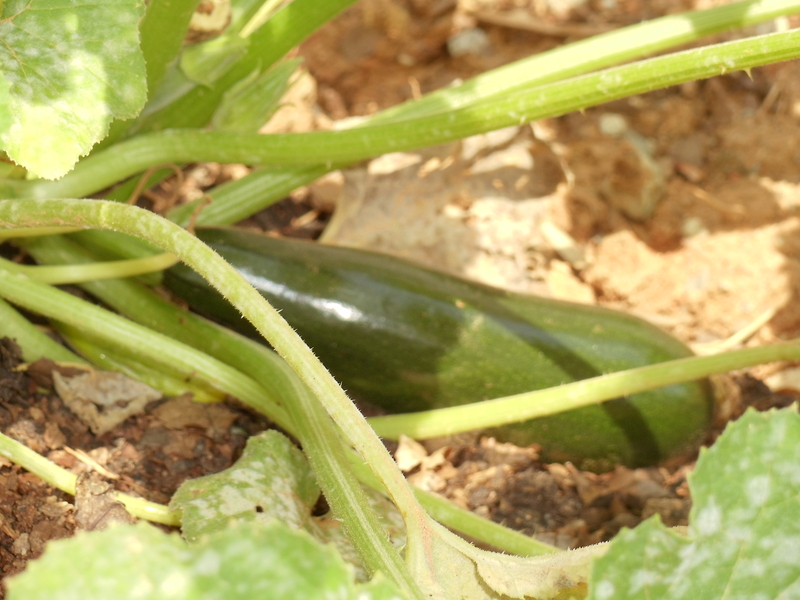 Or how the zucchini grew an inch overnight? 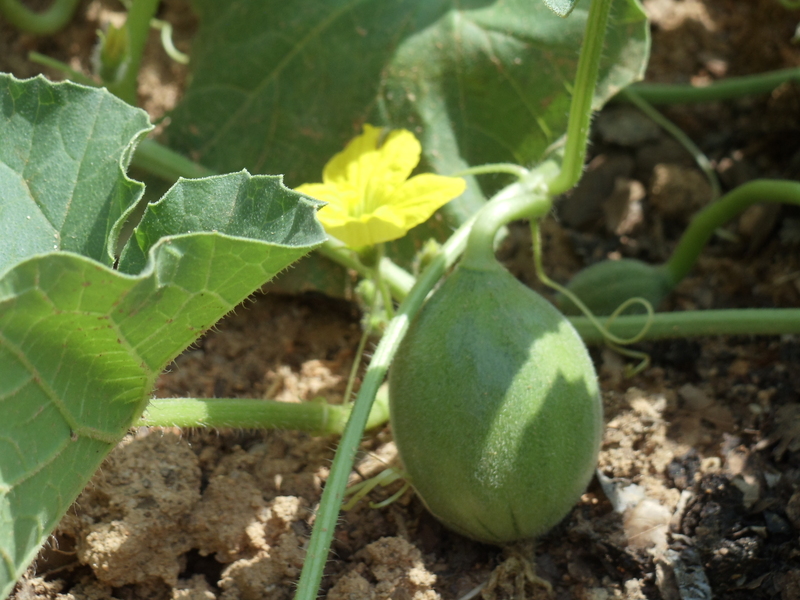 Or how that cantaloupe blossom turned into a baby fruit seemingly in an instant? God does it, and I get to delight in it. What gifts! I wonder if He delights in the fruits He produces in our lives as much as I delight in what He produces every morning in my garden. Does He get giddy when we show generosity, or exhibit patience, or control our impulses? Does He laugh with us in our joy? Or smile when we are kind? As much as I would like to take credit for these glimmers of fruit in my life, I can’t. 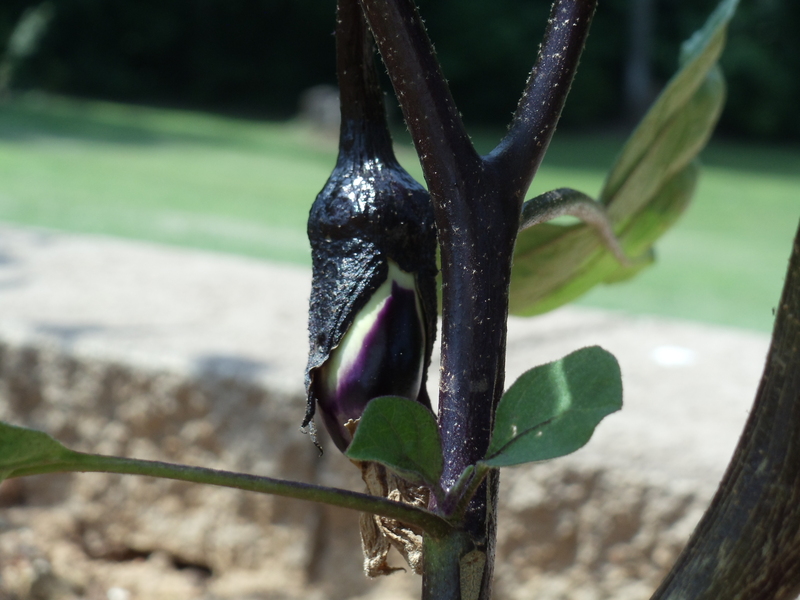 He is doing the work in me, as surely as He is coloring the eggplant in my garden. My part is to create the best conditions possible by reading His word and keeping Him close company. Do you see any fruit growing in your life? Look closely. Don’t you see His handiwork in your life? Have you seen His work in someone else’s life? Digging deeper: Our lives are meant to bear fruit. You’ve probably read this before, but take a close look at Galatians 5:13-26. This is a brief explanation of what it means for us to bear fruit. Are there any fruits missing in your life? Where does your garden need some tending? Let’s pray: Dear God, I want to delight You with the fruit of my life. Do Your good work in me. Tend all the dry and fruitless places in my heart so that my life may be pleasing to You. In Jesus’ name, amen. I heard a strange noise this morning. It was me, grumbling. For me to grumble is (unfortunately) not unusual, but it is strange in that I have nothing to grumble about, really. To the casual observer, my life is perfect. Today, my ears were opened to my own discontent. As I got myself ready for the day, the monologue continued. My list of grievances about my sorry life grew. I grumbled about everything. Oh, yes. I had worked myself into quite a huff. Was I being ungrateful? Yes. Whining much? You betcha. But underneath the grumbling was a feeling I hadn’t been aware of until today. Like Dorothy in The Wizard of Oz, I want to go home, wherever that is. I am in this strange land of motherhood/wifehood/personhood, and it’s fraught with unexpected challenges and dangers. I feel powerless to change any of it, little realizing that the choices I have made brought me here. I find myself dependent upon a cast of unlikely characters for help. Ah, but there is my mistake. I fail to realize that many of the things bothering me are well within my power to change because of the Spirit who indwells me. If God is the power behind my efforts, how can I be power-less? My family will never care one whit about the status of the sofa pillows. (I probably shouldn’t either.) But I can change. I’ve had the power all along. I just didn’t know it. Have you been there? Have you grumbled about your job, your life, your __(fill in the blank)___? If so, it’s time to go home, Dorothy. You’ve had the power all along. Last week, our family was supposed to have been enjoying a vacation in Orlando, FL. It was to have been a refreshing getaway for spring break. But, alas, that was not to be. Our older daughter contracted a significant illness which kept her out of school for almost two weeks and required many doctor visits. Since the penalties for cancelling our trip would have been steep, we decided that I would stay home with her while my husband took our younger daughter to Florida. If you are thinking that my older daughter was jealous, that her mother was stressed, that her father felt guilty for leaving and that her sister bounced between compassion and excitement, you would be correct. It was at this point that each member of my family faced a choice. We could let the circumstances devastate us, or we could choose to be thankful. I have heard of people of great faith thanking God in horrendous situations, and I have regarded them with incredulity. I thought maybe they were faking. Or maybe they were putting on a show of piety. Or maybe they possessed way more faith than I would see in my lifetime. And it happened to my daughter. To keep our spirits up, we named everything we could think of to be thankful for about that particular situation. We thanked God for clean hair when she finally got to shampoo after a week. We thanked Him for Chinese take-out. We thanked Him for inside jokes that made us laugh and briefly forget about pain. We thanked Him for wise, compassionate doctors and nurses. We thanked Him for medicine, and Mr. Brown letting her skate on all the history homework she missed, and the friends who stopped by with cards and gifts, and new sweat pants, and a host of others things that you might find odd. God did not take away the circumstances. Instead, He provided us with grateful hearts. It wasn’t that my daughter and I are women of faith for the ages. It was that God is good. Shortly after we were married, the company my husband was working for folded under mysterious circumstances, and its owner disappeared into the night. For the next eleven months, my husband was without full-time work. We were broke. We weren’t exactly rolling in the dough before he lost his job. We were young and just beginning our careers, so this was quite a blow. We took work anywhere we could get it. I had a few piano students, took singing gigs wherever I could and decorated ice cream cakes at his mother’s store. He worked for a neighbor who had a landscaping business and took odd jobs from anyone who offered. We ate rice and beans. We went to the public library for dates. We bought our clothing at thrift stores. And when it all got to be too much, we volunteered at a soup kitchen to remind us that there were others who had it far worse. We couldn’t give up, though. 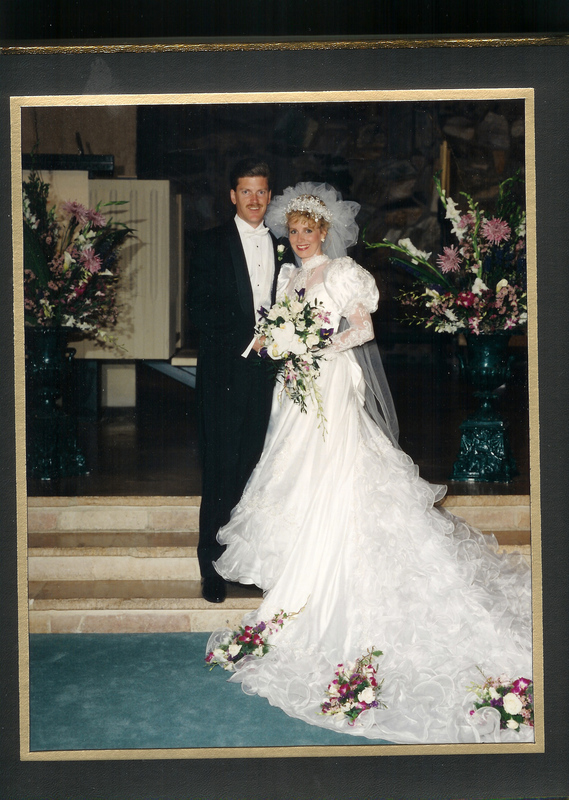 We had freshly promised before God and many witnesses to stick with each other “in plenty and in want.” With some age and perspective on me now, I can see that God gave us that time of want as a wedding gift. We were dependent upon each other for survival, so we learned trust. We worked on our situation together, so we learned teamwork. We had very little, so we learned the benefits of simplicity. We couldn’t afford everything we needed, so we learned to set priorities. We were desperate with worry, so we learned to depend on God. Funny, it’s those early days I miss – days before kids and schedules and mortgages and careers. Life was simpler then. I have a feeling that our life will return to simplicity once again. But by that time, the girl in the marshmallow wedding dress and the guy with the inappropriate moustache will be silver-haired and wrinkly. And we will thank God for our most unusual wedding gift – a disguised blessing.